South Sudan's major donors have raised concerns over the fighting in East and West Equatoria, saying it could derail the fragile peace agreement and lead to a humanitarian crisis. The Troika -- The United States, Norway, and the United Kingdom -- who are the main funders of the South Sudan peace process, on February 21 issued a joint statement raising alarm over the escalating conflict around Yei, saying it was in breach of the December 2017 Cessation of Hostilities Agreement and the September 2018 revitalised peace agreement. "We are particularly disturbed that fighting by all parties in the Yei area has severe humanitarian consequences for the local population. This renewed violence risks undermining the peace agreement and lowers confidence of the Troika and other international partners in the parties' seriousness and commitment to peace at a critical time of the pre-transitional period of the revitalised peace agreement," the Troika said in a statement. 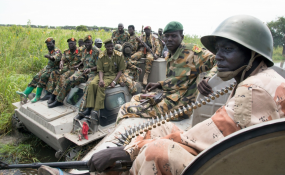 The war in Equatoria has changed the dynamics and brought the war closer to Kenya and Uganda, as opposed to previously when it was mainly concentrated in Upper Nile near Ethiopia, pitting President Salva Kiir's forces against those of Dr Riek Machar. There are concerns that Gen Swaka's group, based in Central and West Equatoria, could cause more humanitarian crises because the Equatorias are the main bread basket of South Sudan, main routes for the country's exports and are close to the capital city Juba. "We would by now expecting foodstuff from Yei since the Revitalised Agreement was signed in September, but the presence of NAS forces around Central Equatoria and part of Western Equatoria has affected food supply to the capital city Juba," said James Oryema, Sudanese People's Liberation Movement in Opposition (SPLM-IO) representative in Kenya. Civilians have been displaced, affecting food flow to the city and other locations northwards. But James Morgan, the South Sudan Permanent Representative to the African Union told The EastAfrican that while the fighting in the country's bread basket is worrying, Gen Swaka is just seeking recognition and he poses no threat to the peace process. "We are confident that Gen Swaka cannot become a force unless regional countries allow him to launch attacks from their territories. We in the government believe that his activities are being promoted by the international media at the behest of people who are anti-peace," said Mr Morgan. Gen Swaka claims to have 30,000 troops under his command in addition to leading an umbrella group of militias of the holdout -- South Sudan National Democratic Alliance. "There will be no peace talks again because people are tired of peace talks. The only thing is to persuade the holdouts to join in the implementation where their concerns can be addressed," said Dr Okuk.